We’re big football fans in my house, so this time of year is heaven for us. Every Sunday we put out big spreads to pick at all day long, chips & salsa, homemade pretzels, stuffed breads, homemade mozzarella sticks… well this past weekend I decided to make a creamy spinach dip, and it was fantastic. This isn’t just boiled spinach tossed in cream of spinach soup or sour cream. Oh heck no! 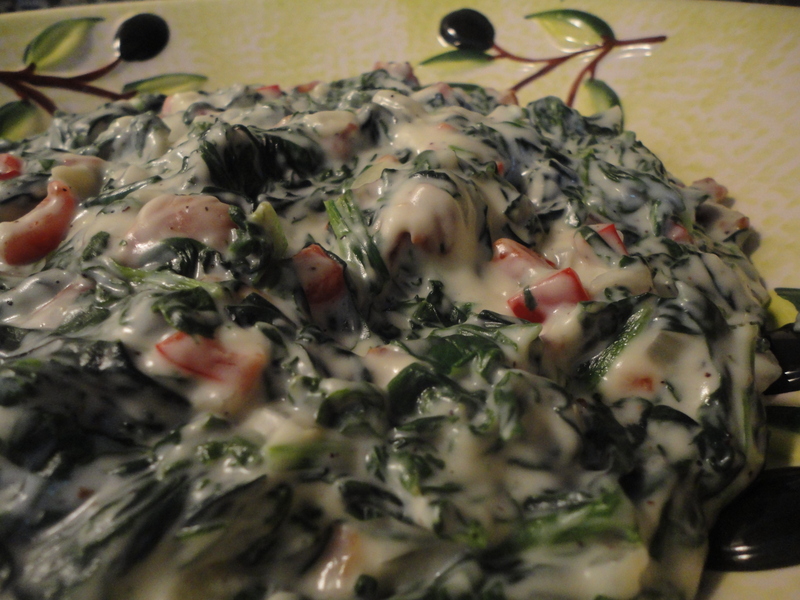 We’re talking a garlic & parmesan béchamel, thick cut bacon, bell pepper… This is spinach dip taken to 11! If you’re a fan of chips and dips, you simply HAVE TO TRY this recipe. And don’t worry, it sounds fancy, and compared to most spinach dips it is, but it is not hard to make at all, and your friends and family will think you’re a dip God after tasting it. Ok, so the first thing you need to do is bring a large pot of water to a boil. Put the spinach in the boiling water, turn off the heat, and cook for 2 minutes. Strain the spinach and run it under cold water to quickly chill (this halts the cooking process). Use your hands to wring out any excess water from the spinach, then chop it and set it aside. Melt your butter at medium heat in a large pot, then add the onion and garlic, as well as 1tsp of salt. Cook for 4-5 minutes on medium, stirring periodically, until the onion and garlic starts to sweat. Increase the heat to high and add the flour and white wine, stir continuously until a paste is formed. Keep stirring and cook for an additional 2-3 minutes, this will take some of the alcohol and flour taste out of the roux (French term for flour & butter mixture). Add the milk and heavy cream, stirring continuously with a whisk. The flour mixture will initially clump up but will break apart as you continue to whisk. Bring to a boil for 3 minutes, still stirring regularly, then reduce the heat to medium-low. Add the remaining salt, black pepper and grated parmesan and cook for 5 minutes, stirring periodically. Remove from heat and stir in the chopped spinach, bell pepper and crispy chopped bacon. The dip can be served warm, at room temperature, or chilled, depending on preference. If you want room temperature I recommend allowing it to cool for 1 hour, if you want chilled I would recommend at least 2 hours in the refrigerator. Serve it up with your favorite crackers, tortilla chips, or do what I did and serve it with some lightly toasted pita. Be ready to be the most popular person at the party or tailgate… Enjoy! Tags: bacon, bechamel, bell pepper, chips, dip, game day, homemade, perfect pairings, perfect pairings at home, snacks, spinach dip. Bookmark the permalink.